After reviewing our updated meeting room rules and policies, submit this meeting room request form. The system is updated in real time and allows you to see when meeting rooms are available. When submitting a reservation, please ensure that you have included sufficient set up and breakdown time. You must be prepared to vacate the room at the completion of your reserved time. If you have questions or are experiencing technical issues, please contact Jamillah Vernon, Community Relations Coordinator, Meeting Room Room Coordinator, at jvernon@springfieldlibrary.org. 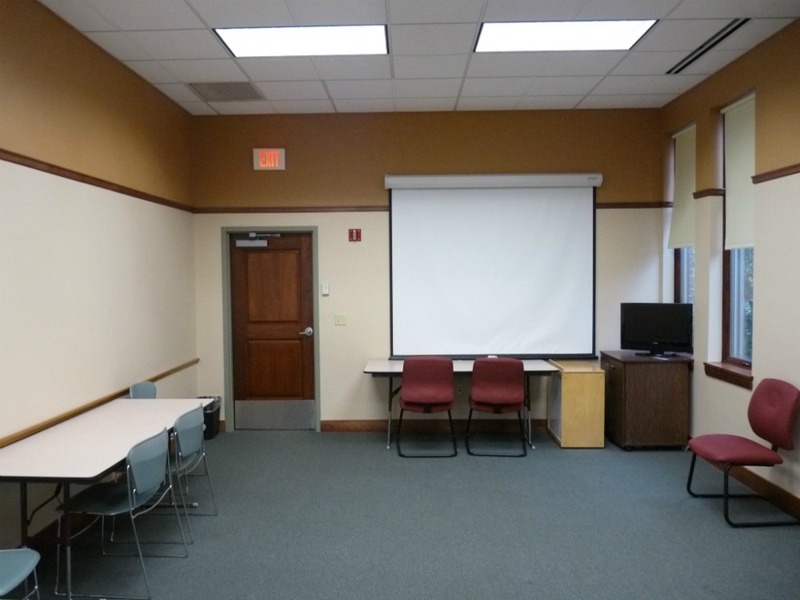 The Springfield City Library has meeting rooms at the Central*, Brightwood**, Forest Park, Mason Square, and Sixteen Acres Branch Libraries. The Central Library also has a computer lab. 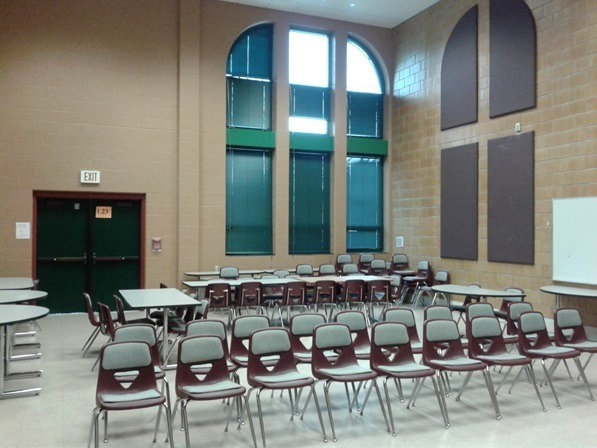 When not occupied, these rooms are available for use by educational, civic, cultural, and governmental groups. They are not available for the benefit of private individuals or commercial concerns. 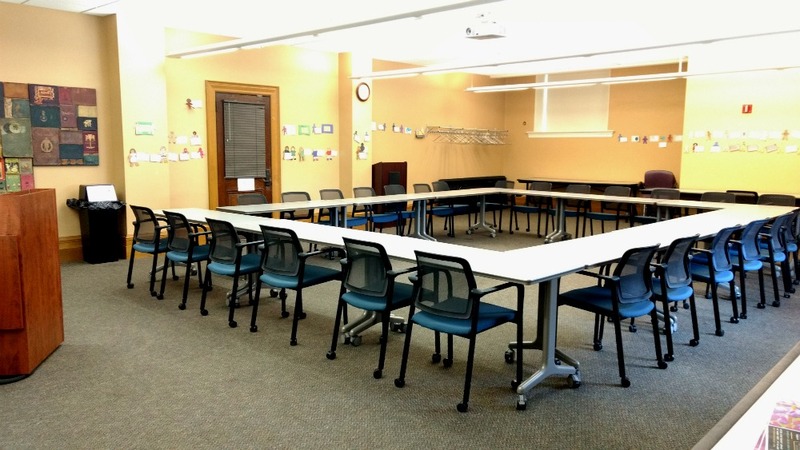 Library meeting rooms may not be used in any way that materially interferes with the operation of the library or which threatens the safety of library property, patrons, or staff. Merchandise, other than items sold to benefit the Springfield City Library, may not be sold. * Entrances to the Central Library from State Street are temporarily closed due to construction. Please use the ramp entrance at the rear of the Central Library on the side of the building that faces the Springfield Museum. We will update this notice when construction has been completed. **Because of its location in the Chestnut Accelerated Middle School, other restrictions may apply. Due to high demand, we recommend submitting a reservation request as early as possible. Reservations must be made a minimum of one week in advance, and only one reservation may be made at a time. Additional reservations can be made only after the applicant’s last scheduled meeting has been held. 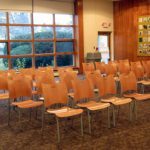 Reservations for meetings in a series are exceptional and require the approval of the Community Relations Coordinator. No admission fees may be charged, with the exception of The Friends of the Springfield Library, Inc. which may charge admission for programs held to benefit the Library. 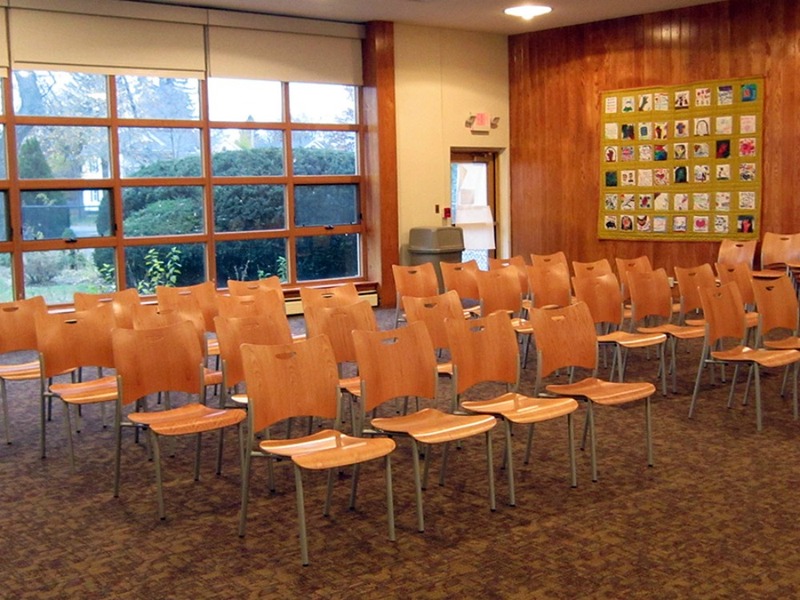 Permission for a group to meet at the library does not constitute or imply an endorsement of its policies, beliefs, or program by the City of Springfield, Springfield City Library personnel, or by the Springfield Library Commission. The applicant is expected to adhere to the stated purpose of the meeting and to conduct it accordingly. The Library’s Behavior Policy and Safe Child Policy apply to all events and programs taking place in a Community Room or Computer Lab. If you are planning on promoting your event and wish to do so in the Library, please see our public posting guidelines. Press releases and meeting notices must use the program description listed on the application and must state the sponsoring agency. Coffee and light refreshments may be provided by the applicant organization, which is responsible for clean-up. The Library must be advised in advance that food will be served; this can be done in the online application. No alcoholic beverages may be served. Food and drink are not permitted in the computer lab. Youth under the age of 18 must be supervised at all times by an adult. By submitting a room request, you are giving the Library permission to release the group contact person’s name and phone number in the event of public inquiries. This contact information will be listed on the Library’s public event calendar. Failure to comply with the meeting room regulations may result in denial of future use of a library meeting room, financial liability for damages, and/or immediate removal from the room. Any question of interpretation of eligibility for meeting room use will be referred to the Library Director. Appeals for exceptions to these policies must be made in writing to the Chair of the Springfield Library Commission. 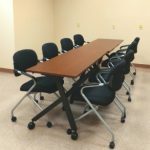 Please see meeting room listings below to see what equipment is available at each location. 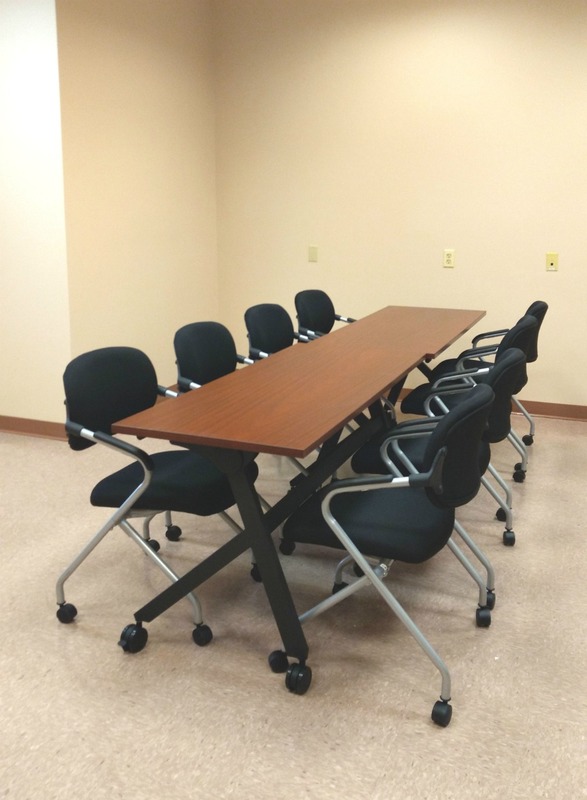 Each meeting room has power and data connections for the applicant’s own equipment. 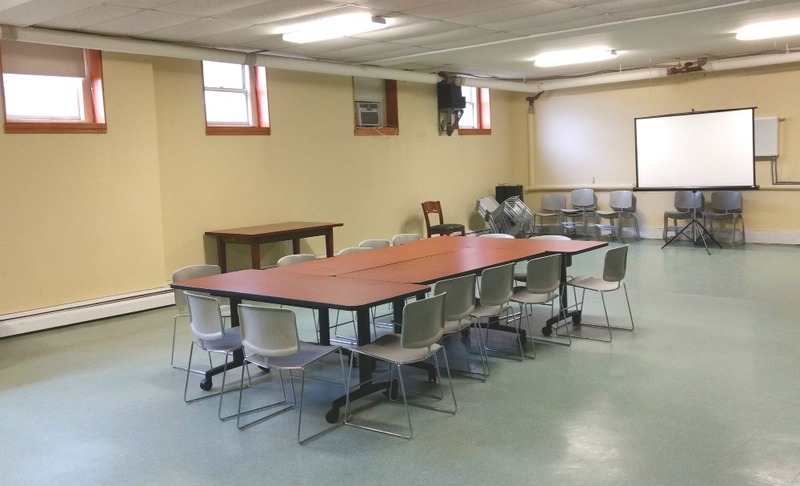 The equipment listed under each Community Room’s description may be available; please include any equipment requests when submitting the online application. The Library cannot offer technology assistance. 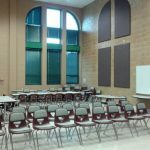 Please review your equipment needs when reserving a room and plan to bring power cords and Apple projector adapters as needed. While meeting rooms are available at no charge during normal library hours, donations will be gratefully accepted. Groups may use the rooms only for the hours reserved in advance. All set-up and clean-up must be accomplished within the reserved time. Meeting rooms are not available beyond normal library operating hours. 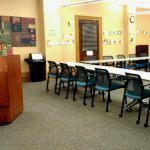 Only the Central Library meeting room may be reserved past open hours; the organization using the room is responsible for paying overtime costs of security and custodial personnel at the rate of $75 per hour. Payment must be received at least one week before the meeting. Checks should be made out to the Springfield City Library and addressed to the Library Director’s Office, 220 State Street, Springfield, MA 01103. Leaving the room as clean and orderly as possible. Put all trash in receptacles provided by the Library. Reporting any spills immediately to the library manager in charge; in the Central Library, please call the Business Office at 413-263-6828 ext. 278. Special cleaning necessary as a result of your use of this meeting room will result in potential charges (minimum $75). Removing personal items, equipment, and decorations. Please do not tape items to walls, windows, and doors. If you have put signs in the hallway directing people to your meeting, please remove them when your meeting is done. All library meeting rooms are wheelchair accessible. Free wireless internet access is available at all locations. 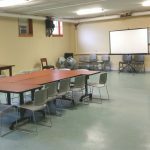 Note: Due to building repairs, this community room will be unavailable from now through June 1, 2019. The Central Library will still be open regular hours during this time. Note: The Central Library State Street entrance is currently inaccessible. Please use the temporary ramp entrance from the Quadrangle. We will update this document when construction has been completed. Location: Street Level. Accessible directly from State Street or from the Quadrangle via interior elevator. Capacity: 75. There are typically tables and one podium available. Set-up: Applicant is responsible for setting up room. *Note: All Equipment is installed in the room, no special request needed for the listed equipment. Note: The Central Library will be open regular hours during construction. 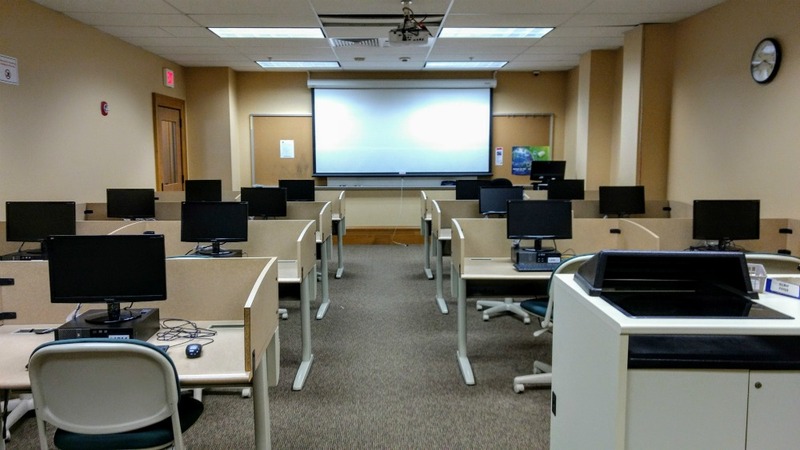 Before scheduling use of the Computer Lab, please consider your meeting participants’ ability to access the room through the alternate entrance. Entrances to the Central Library from State Street are temporarily closed due to construction. Please use the ramp entrance at the rear of the Central Library on the side of the building that faces the Springfield Museum. We will update this notice when construction has been completed. Location: Street Level. Accessible directly from State Street or from the Quadrangle via elevator. Capacity: 14 students and one instructor. Set-up: Applicant is responsible for setting up room and returning to original set-up. Parking: In State Street parking lot, located across the street from the Central Library. During the construction project, parking is also available in the Springfield Museums’ lots on Edwards Street. Location: Street Level. Accessible from Plainfield Street. Capacity: 100. There are typically 4 tables and one podium available. Set-up: Applicant responsible for setting up room. Parking: In Chestnut Accelerated Middle School parking lot; parking is limited during school hours. Note: Due to building repairs, the community room will be unavailable from now through March 31, 2019. The Forest Park Branch Library will still be open regular hours during this time. Location: Lower level. Accessible from Oakland Street, with a lift to the Lower Level. Capacity: 12. There are typically 5 tables available. Set-up: Applicant must set-up room. Equipment: This room does not have any equipment. Accessible: take State Street to Hawley Street or Monroe Street to reach accessible entrance. Capacity: 75. There are typically 8 tables and one podium available. Equipment: Projector screen, ceiling-mounted projector*. Parking: In library parking lot. Equipment: Television and projector screen. Parking: Ample parking in adjacent lot, shared with Greenleaf Community Center. Approved by Springfield Library Commission September 1, 2010. Revised, January 4, 2017.